And here's another reason to layer before you filter: If your image has a border around it — like the ones shown in Figure 10-6 — you don't want Photoshop to factor the border into the filtering operation. To avoid this, select the image inside the border and press Ctrl+J to layer it prior to applying the filter. The reason is that most filters take neighboring pixels into consideration even if they are not selected. By contrast, when a selection floats, it has no neighboring pixels, and therefore the filter affects the selected pixels only. 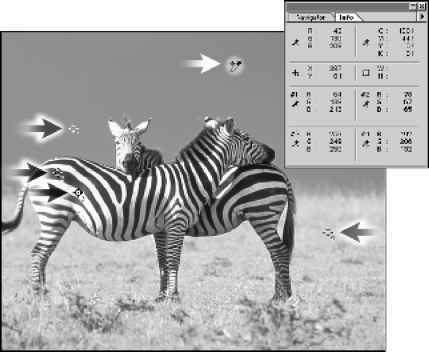 Figure 10-6: The results of applying two sample filters to images surrounded by borders. In each case, only the image was selected; the border was not. Layering the right examples prevented the borders from affecting the performance of the filters. 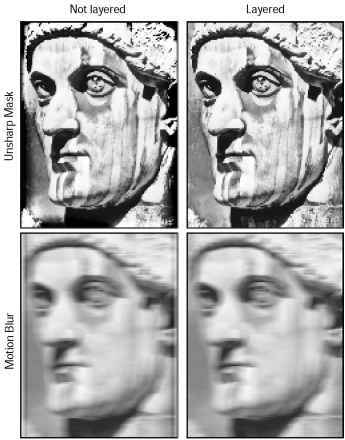 Figure 10-6 shows the results of applying two filters discussed in this chapter — Unsharp Mask and Motion Blur — when the image is anchored in place and when it's layered. In all cases, the 2-pixel border was not selected. In the left examples, the Unsharp Mask filter leaves a high-contrast residue around the edge of the image, while Motion Blur duplicates the left and right edges of the border. Both problems vanish when the filters are applied to layered images, as seen on the right. Even if the area outside the selection is not a border per se — perhaps it's just a comparatively dark or light area that serves as a visual frame — layering comes in handy. You should always layer the selection unless you specifically want edge pixels to be calculated by the filter.